A Blacktip Island bar owner, concerned about a spate of near-accidents outside the Sand Spit bar, this week installed a pedestrians-only overpass to get drunk patrons to their vehicles safely. “Customers were getting clipped crossing the road, walking into passing cars, you name it,” Sand Spit owner Dash Goby said. “Our customers get run over, we’ll be out of business in no time. I had to do something. Sand Spit patrons applauded the move. “You don’t even notice you’re using it,” James Conlee said. “It slopes up, then back down so gentle you don’t know if it’s a bridge or what you’ve been drinking. The overpass has alarmed others in the community. Goby was quick to defend the overpass. “I’m keeping people alive and safe, period,” he said. “What they do across the road is their business. Hell, most of them pass out in their cars anyway. The island’s police had mixed feelings about the overpass. “It’s not adding to the drunk driving problem. These people are going to do that anyway, bridge or no,” Island Police Constable Rafe Marquette said. “If it keeps drunks from being hit by cars, that’s a good thing. Inspired by missing persons milk cartons, a Blacktip Island citizens group began placing missing residents’ faces on rum bottles at island bars Monday. “We tried milk cartons, but no one on Blacktip gives a damn about milk,” Keen to Eliminate Lost People founder Harry Wrasse said. “But rum bottles? Blacktippers spend most of their free time staring at them. The effort is funded by a local crowdsourcing effort. Bar rum bottles have been fitted with clear plastic sleeves that allow bartenders to change photos as needed. The project has draw opposition from locals concerned about misuse and privacy issues. “Less than a week and it’s already a train wreck,” resident Reg Gurnard said. “First, Kitty Katz posted a photo of her husband Mickey. That didn’t end well. Organizers are not daunted by the criticism. “There’s been a few hiccups, sure. But we’ve done a lot of good, too,” Blenny said. “We found a missing tourist just yesterday. He’d taken a resort bike for a ride around the island, only he kept taking the crossover road and kept circling the south end. He’d still be out there if it wasn’t for KELP. A Blacktip Island distillery’s plan to pipe rum to every home on the island came under fire Thursday from an unlikely alliance of the island’s religious community and bar owners. “Drinking’s already out of control on this little rock,” said the Rev. Pierre Grunt. “This plan will let people sit at their sink and drink until they pass out. Brewery owners defended their plan. “Our market’s tiny. We’re fighting to survive financially,” Bottoms Up Distillery president Barry Bottoms said. “The idea’s to make our new Bottoms Up dark rum readily available to everyone. Grunt found support from the island’s bar owners. “Barry’s playing dirty pool, siphoning customers away from us,” said Eagle Ray Cove resort owner Rich Skerritt. “Before, we’d buy booze from Barry, mark it up, sell it to our patrons. This plan cuts us out of the loop. Many residents, however, are excited about the plan. “It’ll be great, never being out of hootch,” divemaster Gage Hoase said. “Unless you don’t pay your bill and they cut you off. And the monthly billing’s like running a bar tab, really. Plus, they give volume discounts. Bottoms, meanwhile, said Bottoms Up is sensitive to residents who oppose the plan. “Getting your house rum plumbed is 100 percent optional,” Bottoms said. “It does increase the home’s resale value, though, so we’re suggesting church goers and A.A. types get the line installed and then just cap it off. 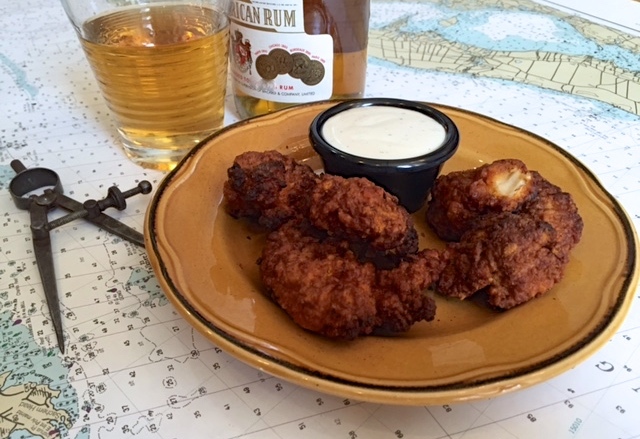 Rum and chicken wings are health foods with the new Pirate Diet. A Blacktip Island nutritionist is promoting a new eating regimen, dubbed the Pirate Diet, that promotes healthy weight loss by replicating the eating habits of 16th– and 17th-Century buccaneers. “This is no fad. The diet’s rooted in science and historical fact,” said nutritionist Leah Shore, the diet’s creator. “It incorporates everyday, modern foods that mimic the foods our pre-industrialized forebears thrived on. Shore maintains the diet causes the body to catalyze stored fat into lean muscle due to meals high in protein, fat and rum. Local pirate dieters rave about the results. A strict exercise regimen accompanies the diet. Local health professionals, however, are critical of the diet’s historical basis. Tang also questioned the diet’s safety. “This sort of fad diet can wreak havoc on the human body,” Tang said. “Take a look at any of this island’s divemasters. “And none of the diet’s proponents have addressed its associated memory loss and verbal aphasia,” Tang added. Shore was quick to defend the diet. Pirate dieters echoed that sentiment. A Mount Rushmore-inspired Bangles homage in its early stages on the Eagle Ray Cove beach. May’s southwest winds have piled turtle grass high on Blacktip Island’s western beaches, heralding the Turtle Grass Sculpting Contest at Eagle Ray Cove resort. 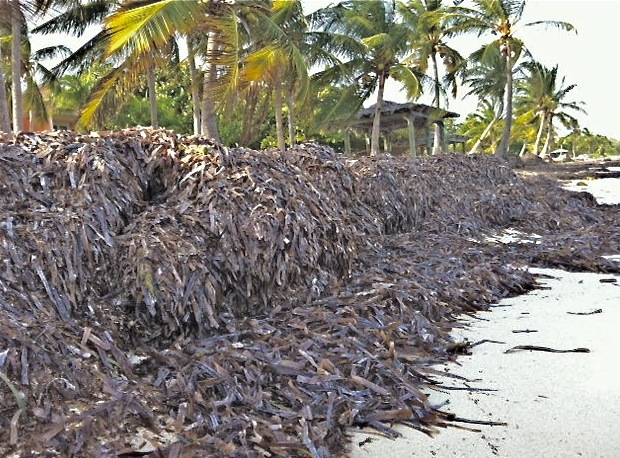 “The wind and the currents mound the seaweed up at The Cove like no place else on the island,” resort manager Mickey Smarr said. “There’s tons of it. Literally. Last year we hauled away 6,800 pounds in May alone. Four-person teams have half a day to create their most imaginative sculptures before the grass rots. Past winning entries have included a scale model of the Kremlin, a linear depiction of the Battle of Waterloo and a couchant fuzzy bunny rabbit. This season’s entries are equally impressive. As with any island competition, emotions run high. “There’s extra security on hand after last year’s seaweed fight,” Eagle Ray Cove’s Mickey Smarr said. Contest winners receive bottles of Flor de Caña rum and tubes of cortisone cream. Losers are required to haul away the turtle grass afterwards. All contestants receive complimentary tetanus shots. Spectators are advised not to stand downwind of the sculpture area. Tiperon Airways is providing airsickness bags for those who ignore the warning.